Point Foundation (Point) will honor Good Morning America Anchor Robin Roberts with the Point Courage Award at the organization’s annual Point Honors Los Angeles gala October 1. The award recognizes those who have advocated for the future of the LGBTQ community and believe in the vision that investing in today’s potential will produce a brighter tomorrow. Roberts is a proud member of the LGBTQ community and a survivor of breast cancer. Her willingness to publicly share her medical odyssey was recognized with a Peabody Award, as well as the admiration of millions. TV personality and restaurateur Lisa Vanderpump will present the award to Roberts. Also at the October 1 event, the Point Impact Award will be presented to producer and broadcast executive Michael Lombardo by actress Molly Shannon. Comedian Tig Notaro will host the evening, which will include appearances by Wendi McLendon-Covey, Jeffrey Bowyer-Chapman, and Matt Walsh, among others. Additional celebrity participants will be announced shortly. Information about attending or supporting Point Honors is at www.pointfoundation.org/LAHonors. 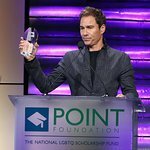 Point Foundation is the nation’s largest scholarship-granting organization for lesbian, gay, bisexual, transgender and queer LGBTQ students of merit. Some of Point’s 84 current scholarship recipients and 244 alumni will be present at the event to share with the audience their inspiring stories about how they have overcome challenges to get their higher education degrees. Local Media Sponsor: The Pride L.A.